Politics has been dominating the discussion around the World today, following Britain's 'Brexit' from the European Union. I guess then it's only fitting to discuss EW's latest revelation about the return of the former 'political' Senator Mon Mothma to the cinematic screen. In the time period of Rogue One, Mon Mothma is responsible for unifying the divided star systems who are facing terror and tyranny from the evil, Galactic Empire. EW and Lucasfilm President Kathleen Kennedy have made it clear that Mon Mothma's role in Rogue One will be "significantly larger" than her last on-screen appearance in Return of the Jedi. Kathleen Kennedy: We actually see quite a bit of her (Mon Mothma). The Rebel Alliance is in disarray. Pretty panicked. Up against it. And she is trying the best she can to provide the leadership, in amongst a wide variety of Rebel soldiers that have very differing opinions as to what to do. EW have termed Mon Mothma as the "Mother of the Rebellion" and based on Kathleen Kennedy's words it seems as though Mon Mothma will take that mantle on, as she leads the newly formed, yet diverse, Rebel Alliance in its fight against the Empire. 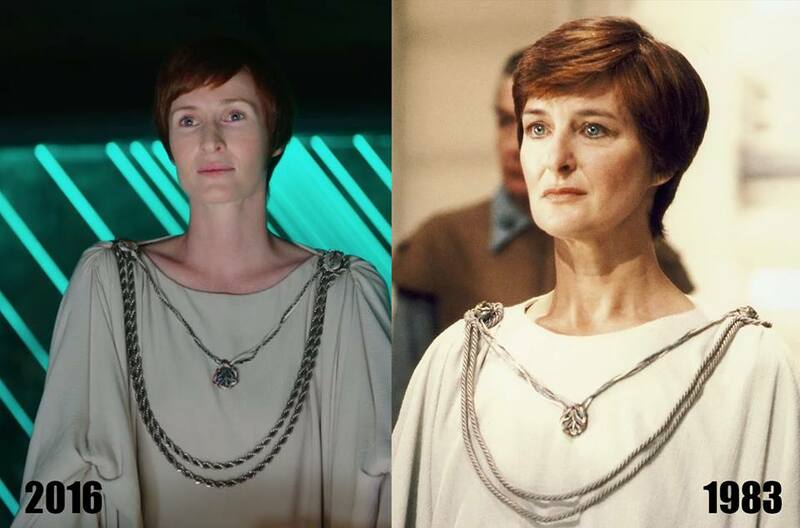 Mon Mothma will be played by Genevieve O'Reilly who bears a striking look to Caroline Blakiston (the actress who played her in Return of the Jedi, 33 years ago). What do you make of the fact that Mon Mothma will play a "significant role" in this movie? Are you excited? Leave a comment in the description down below. Glad to see O'Reilly's Mon Mothma finally make it to the screen, after her appearance in Revenge Of The Sith was cut.